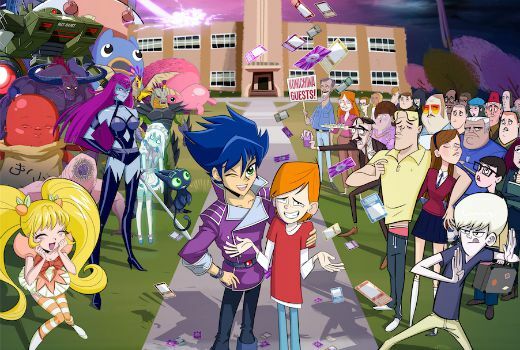 Cartoon Network’s local production Exchange Student Zero is back this weekend, returning to the world it debuted in 2012. Rove McManus voices five characters in the series drawing upon both Japanese anime and Western animation. The series by Melbourne-based Bogan Entertainment is produced by former Spicks and Specks producer Bruce Kane. The comedy adventure follows the story of school friends, Max and John, who are obsessed with a fantasy card game: Battle Day Zero. The unlikely heroes accidentally bring one of the game’s characters to life and unknowingly open a portal between the anime world and their sleepy town. Life will never be the same again! Card play goes feral when the boys realise they can spin Denmead between worlds at their whim. Max and John are having too much fun to heed Hiro’s warning and find themselves with not one but two Denmeads. Expecting double trouble (read double pounding) they are surprised when the Denmeads fall head over heels with each other and are too infatuated to seek retribution. It proves to be a challenging situation for all concerned, particularly Charity who is convinced Denmead is having an affair… imagine her surprise when she finds out who it is with. 9:30am Saturday September 26 on Cartoon Network.